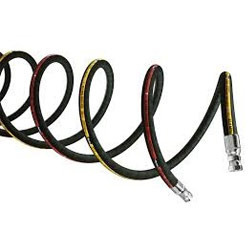 Being a leader in the industry, we are engaged in offering a qualitative range of HIGH PRESSURE SPIRAL HOSES. Provided pipe is well-manufactured by skilled professionals using optimum grade basic material and latest techniques. Owing to its high tensile strength and seamless finish, this pipe is widely demanded among our clients. Moreover, before being supplied to our clients, the offered pipe is rigorously tested by our quality experts on various quality parameters. Established in the year 2002 at Ahmedabad (Gujarat, India), we “Harsha Enterprise” are the Sole Proprietorship firm, highly engaged in manufacturing and supplying the finest quality range of Hydraulic Pipes, Teflon Hose Pipes, Hydraulic Fittings, Low Pressure Rubber Hose Pipe And Fittings, etc. These products are widely demanded for their high tensile strength, durable finish standard, Uniform thickness, abrasion resistance and precise design. The offered product range is precisely manufactured in accordance with the set industry standards using quality assured basic material and modern technology under the guidance of our experts. Our offered products are examined against various quality parameters to deliver a flawless supply at the clients’ end. Moreover, the entire product range is also available in various specifications as per the requirements of valued clients.